I had some difficulties finding the original ingredients so I switched some of them, the result was actually tastier than I expected! Preheat the oven to 375°F (that's 190°C), butter 12 regular muffin cups (I used paper baking cups but next time I won't because when the cheese in the mixture melted it got stuck to the paper cups). Mix together in a medium bowl these dry ingredients: the cornmeal, flour, baking powder, baking soda and salt (and sugar). In another bowl, whisk the buttermilk, the eggs and the melted butter, then add the cheese and the jalapeños. Add the buttermilk mixture to the dry ingredients and lightly incorporate them. Pur the batter in the muffin cups and bake for about 15/18 minutes. If you want you can add a slice of jalapeño a couple of minutes before teking them out of the oven to decorate. As I mentioned before, I wasn't expecting a huge success in this recipe but it actually came out really good, perhaps a bit dry in taste, probably I should have used a bit more cheese. 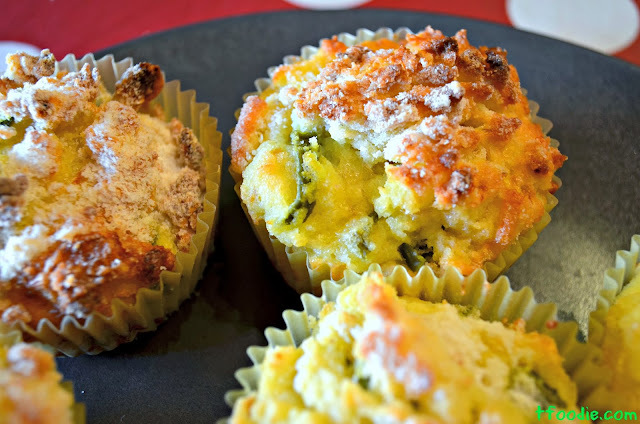 I'm thinking this muffins can be a good meal starter, you know, like the bread baskets they have in restaurants, these with some herbs butter would be perfect - next time I'll try baking them as buns!